This year’s Allied Air Forces Memorial Day was blessed with weather that steadily improved throughout the day. As we arose on Sunday Morning, it seemed that the planned Battle of Britain Flight flypasts may well be in doubt, as low clouds hung over Elvington. We need not have worried since, as the gates opened and visitors poured in, the cloud steadily cleared leaving everyone to enjoy a mild September Sunday. This year, the ceremony particularly Commemorated the Centenary of the Battle of the Somme, the first battle in history to feature dedicated military air campaigns, in addition to marking the contribution of allied service personnel who served in conflicts from WWI to the present day. The occasion represents a coming together of nations to reflect upon the sacrifice made by so many in military aviation across the years. Air Vice-Marshal Richard Knighton (Asst Chief of the Air Staff) and Lord Lieutenant of North Yorkshire, Mr Barry Dodd salute Flt Lt Neil Foster RAF VR (T) prior to Inspection of the Guard of Honour by 169 City of Leeds Squadron and 96 Dewsbury Squadron Air Training Corps, which started the Day’s formal proceedings. With the Museum’s status as the home of the Allied Air Forces Memorial confirmed this year, the wide variety of nations represented was greater than ever, with air force representatives from as far afield as Finland, New Zealand, Australia, Russia and the United States all present to acknowledge the sacrifice made by air forces personnel across the ages of military aviation. More than 2000 guests and participants came from across the UK and far beyond, creating a unique combination of military aircraft, pageantry and international participation. Guest and visitors enjoyed the sight and sound of live aircraft from within the Museum’s Collection, as the two WWI fighters in the form of the Eastchurch PV8 “Kitten” and 1916 Royal Aircraft Factory SE5a fighters ran their engines, with re-enactors in period uniform in attendance, again reflecting on the 1916 Battle of the Somme. The beautiful WWII Douglas Dakota, an aircraft historically associated with the 1944 D-Day Invasion of the Normandy coast and other airborne campaigns also roared to life amidst a plume of smoke. Lastly, the Nimrod MR2 XV250, known as the Mighty Hunter, was powered up with her four Rolls Royce Spey engines providing some real thunder for people to enjoy. Following the Museum’s aircraft runs, visitor focus turned to the Parade, led by the Yorkshire Military Band & Thirsk Royal British Legion Band Corps of Drums. Significantly, the National and County Standards of the Royal Air Forces Association, Royal British Legion and Royal Observer Corps Association led the 55 other regional Service Association and Squadron Standards presented on the day. It is not often that these National Standards are seen together, making an impressive sight. After taking the Salute from the Lord Lieutenants of North Yorkshire and East Yorkshire (Mr. Barry Dodd CBE and Mrs. Susan Cunliffe-Lister) and the Asst. 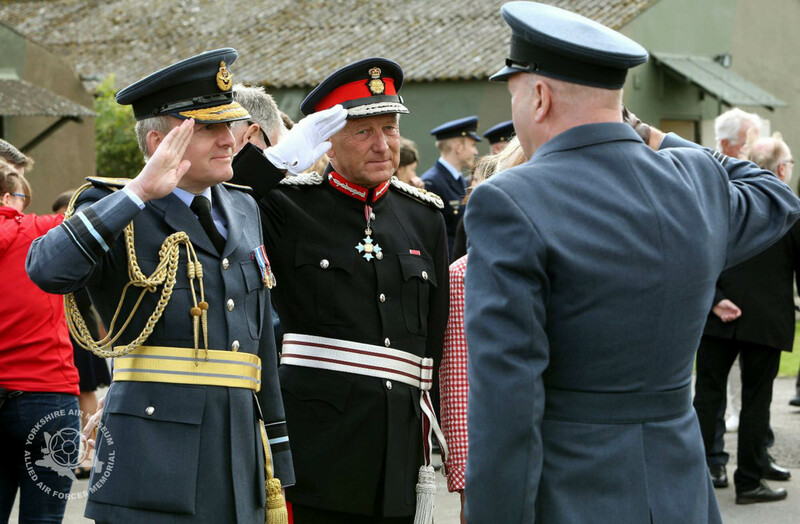 Chief of the Air Staff, Air Vice Marshal Richard Knighton, along with senior international air force representatives and other Civic Dignitaries from across the region and beyond, the Standards were Marched into the Drum Head Service in the Main Display Hangar. Overlooked by the Museum’s Halifax bomber Friday the 13th, the National Standards were laid over the Drum Head as a focal point for the Service. Bringing additional poignancy to the Service, the Légion d’Honneur was presented to 5 Normandy Veterans by Mr Jeremy Burton, the French Consul to Yorkshire and the French Defence Attaché Contre Admiral Patrick Chevallereau, who gave the declaration of thanks on behalf of the French Government and pinned the medals on their blazers in a proud moment for the veterans and their families. Following the Service, another highlight of a truly wonderful September day was the evocative flypast display by the stunning WWII Lancaster bomber from the Battle of Britain Memorial Flight, which made three graceful, low swoops over the Museum. After a long period of down time for maintenance, it was wonderful to see her overhead the Museum once again, the emotional sight drew gasps of admiration from the crowd, with the beautiful roar of the famous Merlin engines stirring the hearts of all. As the Lancaster retreated into the distance, the Parade was re-formed for the traditional March-past for the ‘Sunset Ceremony’, which saw the Dipping of Standards and Lowering of the Ensign by Air Training Corps Cadets, accompanied by the Evening Hymn played by the Band and Corps of Drums. In the late afternoon sunshine, visitors enjoyed a fitting end to a day of commemoration of the history of military aviation with the Battle of Britain Flight Spitfire and Hurricane delivering a series of low level flypasts over the Museum. Perhaps rather fittingly, the two aircraft were quite significant, as Spitfire P7350 Mk.IIa is the oldest Spitfire flying in the world, and flew in the Battle of Britain. It flies in the colours of top scoring Battle of Britain ace Eric Lock, who on the 5th September 1940 destroyed 3 enemy aircraft in one sortie. Hurricane PZ865 Mk. IIc is the last Hurricane ever built, entering service in July 1944. It was truly wonderful to see these historic aircraft in the skies over Elvington in one of the best flypasts we have seen for some time. “The whole event was a grand and fitting occasion to reflect and remember all those who served and still serve for our freedom and security in conflicts over the years, and we were delighted that air force and diplomatic representatives from Britain, France, Netherlands, Finland, Australia, New Zealand, Canada, USA and Russia joined us for the day,” commented Ian Reed, Museum Director. Thank you to all at the Yorkshire Air Museum. As standard bearer, I represented Morecambe and Lancaster Branch of RAFA. Very professional and courteous staff. Excellent parade briefing from the RAF Regiment SNCO from RAF Leeming. The only negative is the noise from the sports cars using the airfield as a race track. It is a pity they can not show a little respect on this one day a year, if only during the service and sunset ceremony. I look forward to my trip across The Pennines next year and hope my sat nav does not direct me through the centre of York again! The service and parade were excellent and the fly-pasts were superb.